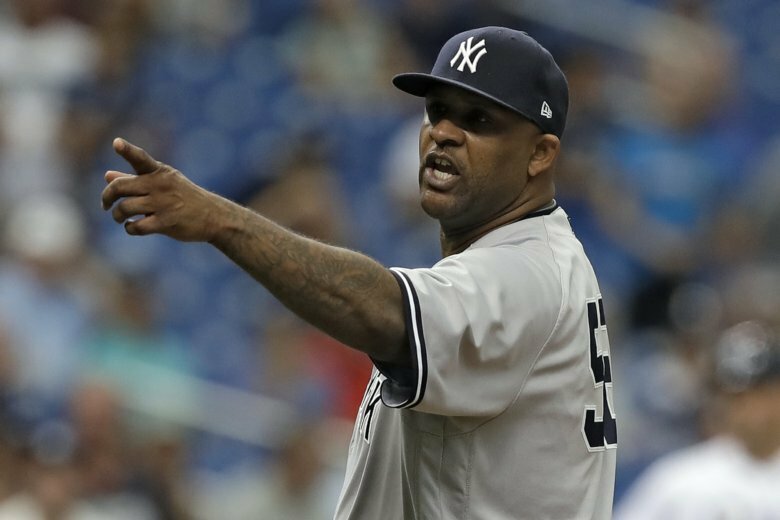 ST. PETERSBURG, Fla. (AP) — CC Sabathia (9-7) got his 246th win and moved New York closer to hosting next week’s AL wild-card game but may have cost himself a $500,000 bonus. Sabathia was ejected in the sixth inning for hitting Jesus Sucre on a leg in retaliation for Tampa Bay reliever Andrew Kittredge throwing a pitch behind Austin Romine’s neck. Making his final regular-season start, Sabathia raised his season total to 153 innings — two shy of a $500,000 performance bonus in his contract for reaching 155 innings. NEW YORK (AP) — Julio Teheran looked sharp in his last audition to become part of Atlanta’s playoff rotation, pitching two-hit ball for six innings in the Braves’ loss to New York. Neil Ramirez (0-3) retired the first two hitters in the 10th before he walked Aldaberto Mondesi, who stole second and third to reach 30 steals on the season. Alex Gordon also walked before Perez hit Ramirez’s first pitch into left field to score Mondesi for the walk-off win. Astudillo, playing in his 26th big league game, capped Minnesota’s five-run third inning when his two-out single drove in a pair of runs to give the Twins the lead. He also added a two-run double in the fifth. Guzman hammered reliever Zach Duke’s sinking fastball into the right-center gap, scoring Ryan Rua, who reached base on a one-out double. Guzman scored after right-hander Shawn Armstrong plunked Isiah Kiner-Falefa in the helmet with the bases loaded later in the inning.